Court Orders North Bay Man to Vacate Crown Land. A North Bay man has been convicted of illegally building a cabin and depositing litter on Crown land. Michael Ranger was fined a total of $1,500. He was ordered to remove the cabin and debris, and to return the site to its original condition by July 1, 2013. On October 23, 2012, court heard that an investigation conducted by Ministry of Natural Resources conservation officers and technicians revealed that Ranger constructed a cabin in 2009 just east of Highway 11, near the community of Tilden Lake, 38 kilometres north of North Bay. The area around the cabin was littered with garbage. Ranger claimed that the cabin was essential to the exercising of his aboriginal right to hunt and gather. The court ruled that Ranger failed to prove that claim. Justice of the Peace Ruby Beck heard the case in the Ontario Court of Justice, North Bay, on January 16, 2013. 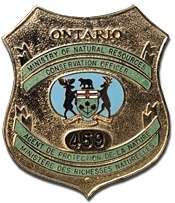 To report a natural resources violation, call 1-877-TIPS-MNR (847-7667) toll-free any time or contact your local MNR district office during regular business hours. ← $2,000 Fine For Hunting Without A Licence.